Art blockbusters don’t jump out in New York City the way they did several decades ago. That’s not all bad, as smaller venues don’t sport long lines. In spite of a blustery mid-April week, husband Dave and I found good hunting, discovering a variety of art spaces. We also caught an ‘off-off’ and a ‘Times Square’ Broadway show and found a new place for dinner. So hop on public transportation with us as we explore springtime art in Gotham. The Metropolitan Museum is always a great place to begin especially when it’s raining and the trees are blooming, causing sniffling. A bus ride up Madison Avenue to this bastion of art is not only cheap, but a great way to engage with real New Yorkers and enjoy ever changing architecture—twenty-first century glass replacing nineteenth century stone and scaffolding galore. The exhibition Plains Indians: Artists of Earth and Sky (thru May 10) combines European and North American collections acquired from French fur traders and Lewis and Clark’s expedition. European Impressionism and American Modernism usually take center stage; it was a pleasure to view art that is often overlooked but impacted the ‘white man.’ Plains Indians had compositional skills and spatial design long before Copley and Sargent left their legacy on North America. The Plains Indians inhabited the Canadian Prairies down through American Great Plains—approximately British Columbia to Texas. They were farmers and hunter-gatherers, following buffalo migrations, eventually acquiring horses from Spanish settlements as well as guns and diseases (smallpox etc.). Although this show pays tribute to the spiritual beliefs portrayed through their aesthetic dexterity, it doesn’t sugar coat the hardships Native Americans endured at the expense of Western expansion by entrepreneurial Easterners. Video artist Edgar Heap of Birds shows his Venice Biennale installation commemorating the Indians and their families who participated in the 1890’s Buffalo Bill’s Wild West European tour. Mr. Cody gave incarcerated Indians the option of performing. Edgar presents his viewers with the conundrum of remaining an abused Indian or acquiring star quality from Europeans who found Indians exotic. His 2007 Biennale exhibition honored the Native American performers who died in Europe. Plains Indians exhibition presents decorated animal hides, pipes, and body- length feathered headdresses. A pair of stone buffalo could easily be mistaken for early twentieth century Brancusi-esque minimalism. Life on reservations was and continues to be challenging–still artists create. 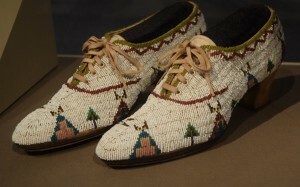 Women’s Shoes (Lakota/Teton Sioux, 1920), shows Indian motifs beaded onto factory made canvas shoes. These shoes reflect the influence European cultures imposed on Native Americans. Shoes carry tropes of work, play, who made them and where. This Western pair competes for attention as does the aftermarket beaded patterning and symbolism. Can the viewer decide which wins? The Met’s basement café is a nice place to have soup and a burger and contemplate the next gallery to visit. We picked up conversations from noshing Parisians and mused the Met should be nicknamed Louvre-2. Don’t let spring rains destroy your art sleuthing. Another ride on a bus, this time down Fifth Avenue, deposited us at forty-second street and the lions outside the New York Public Library. Endowed by nineteenth century scions whose names are carved onto walls (Astor, Schermerhorn), this main branch opened in 1911–the same year the Triangle Shirtwaist Fire killed teenage girls just streets away. Sadly, the main reading room is presently closed because the ceiling is crumbling. The exhibition Public Eye: 175 Years of Sharing Photography reveals the depth of the library’s collection—Mathew Brady, Ansel Adams, even works from the Port of New York Authority. This is a great place to experience marble columns and murals that represent the Beaux Arts style. There is a Gutenberg Bible, a Readers and Writers Shop with lots of kid’s books and ‘wichcraft for a quick bite as you envision Frock- coated men and lamb chop-sleeved women strolling these same corridors decades ago. Perhaps one of them was your relative? New York’s Gilded Age had everything from Edith Wharton-esque Park Avenue snobs to European immigrants pushing carts through dead horse carcasses and seeping sewage that defined lower Manhattan. Times change and evolve. With gallery rents in SoHo and Chelsea soaring, good art finds its way to less trendy places. Adjacent to the library is the Bryant Park subway station where we caught the B train to Grant Street (the former slums of the Lower East Side). Passing Chinese markets with baskets of iced fish and sidewalk vendors displaying household goods, we headed for the Klaus Von Nichtssagend Gallery (54 Ludlow Street) to view Glen Baldridge’s Show Daylighter (thru April 26). 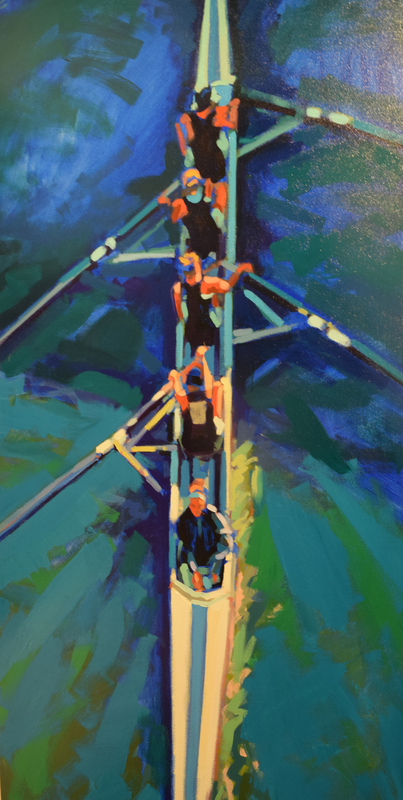 Baldridge is a New York artist who uses Post-Modernism’s stream of consciousness afforded to viewers, bouncing tropes from his childhood in Montana with ones from his presence in Gotham. Baldridge’s Daylighter Series features diamond plate aluminum on stretcher bars. The aluminum is then rainbow-painted with ‘Plasti Dip’ paint. 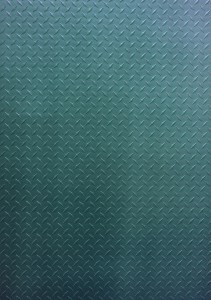 While Baldridge reminisces about seeing this iconic aluminum on trucks in the West, I found the product covering basement entrances on sidewalks—think ‘Dorothy’ and tornado shelters. 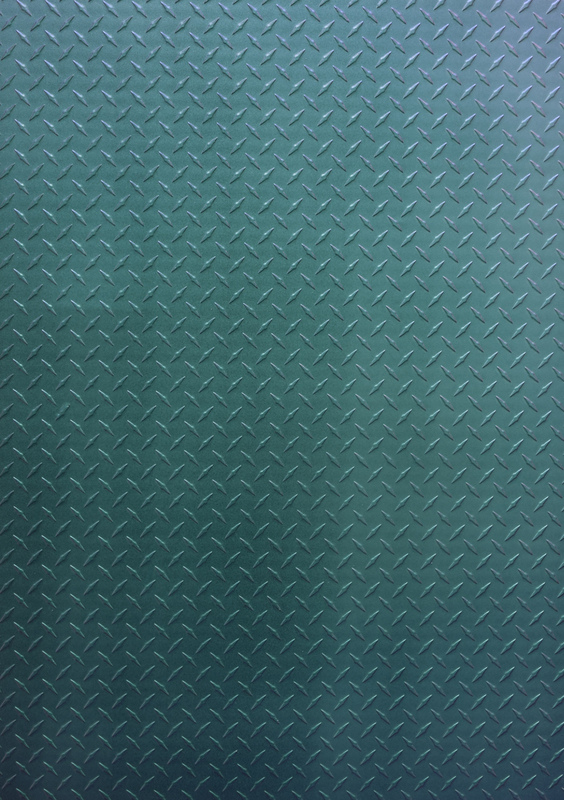 Walk by any Manhattan restaurant and your feet bounce as you hope these diamond plated trap doors don’t give way as you stroll over them—slippery too when it’s raining. Placing industrial material onto stretcher bars traditionally used for canvas or linen compositions sets up all sorts of aesthetic vibrations. Is there a painting hiding behind these aluminum sheets? If not maybe the trace of a painting lurks underneath? And Baldridge’s painted surfaces are rubber, not oil or even acrylic. Interesting though, the rainbow abstractions he creates harken back to the Enlightenment when Newton’s scientific color theory bothered artists who wished to paint rainbows, preferring the emotional aspects they found in Goethe’s texts. We left Baldridge’s works situated in the former tenements for our next stop, the new Whitney Museum relocated in the now trendy meat packing district, which once employed slum dwellers. 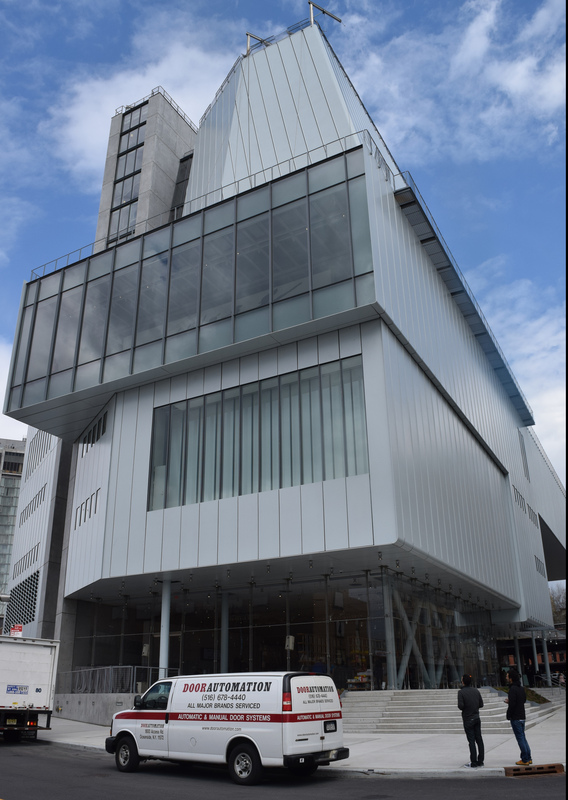 The Whitney Museum, founded by Gertrude Vanderbilt Whitney in 1931, has recently relocated from its concrete bunker on 945 Madison Avenue to its new glass structure on 99 Gansevoort, adjacent to the High Line (one subway change from Grand Central). Good-by Marcel Breuer, hello Renzo Piano! I wasn’t thrilled about viewing another Piano facade that usually floods gallery spaces with outside vistas, thus diminishing the art and favoring the ego-centric architect. 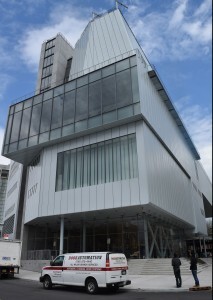 The new Whitney’s exterior seemed rather featureless too. OK, I was impressed–the interior is spectacular. The glass walls sit quietly as do the views of the Hudson River and surrounding urban landscape. Like Boston’s Institute of Contemporary Art, there are interior nooks to take in views without being distracted by art. Mary Heilmann’s Sunset are primary colored chairs strewn across one of the outdoor stacked terraces. Back inside, small walls sit at right angles to each other and provide areas of solitude to contemplate a few works at a time. Pine floors were salvaged from an old warehouse and are surprisingly comfortable to walk on. Three elevators take visitors to the eight floors; the largest one is painted to resemble a giant woven basket, so the museum-goer becomes a commodity as much as the objects that change floors. Two eateries will be open soon—Untitled on the ground floor and the more casual Studio Café on the 8th floor. A shop near the front has t-shirts, art books and a Max Mara bag designed by the Piano Building Workshop. This gray leather bag has sewn vertical lines, essence of the building to take home for seventeen hundred bucks. The exhibition America is Hard to See (thru September 27) takes its name from a Robert Frost poem. Iconic American works both overwhelm and provide comfort: Jasper Johns’ Three Flags, Edward Hopper’s Early Sunday Morning, Edward Ruscha’s Large Trademark with Eight Spotlights, felt like old friends who have merely upgraded their digs. Dave and I will certainly return but it was time to catch more Manhattan spring art venues. We took the 10th Avenue bus uptown to the 2015 Art Expo New York on pier 94, an ocean liner dock reconfigured for trade shows. Galleries worldwide rent spaces to promote their stable of artists. Note to self: coming from a half day at the Whitney was not the best way to enjoy this kind of venue; its loud and gaudy, so give yourself a whole day. Trade fairs have a purpose as street galleries are often intimidating or downright rude to those wishing to window shop. 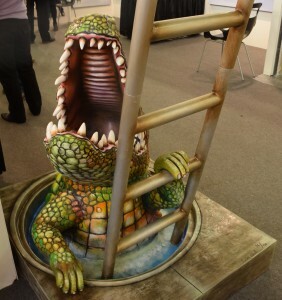 An Expo allows you to cruise many art establishments, picking up brochures and taking photos unobtrusively. We tucked into one of the make-shift cafés run by Butterfield Catering. The squash soup and roll were surprisingly good but pricey as they know there’s no food outside pier 94—just pay and enjoy. Nick Paciorek’s landscapes were blasts of carefully coordinated hues. With one color dominating, he subtly plays with complementaries to an unsuspecting audience. Dave enjoyed the water and shell motif as both he and son Elliott rowed at college. On the way out with our achy feet, we came upon this alligator emerging from a manhole cover and laughed. 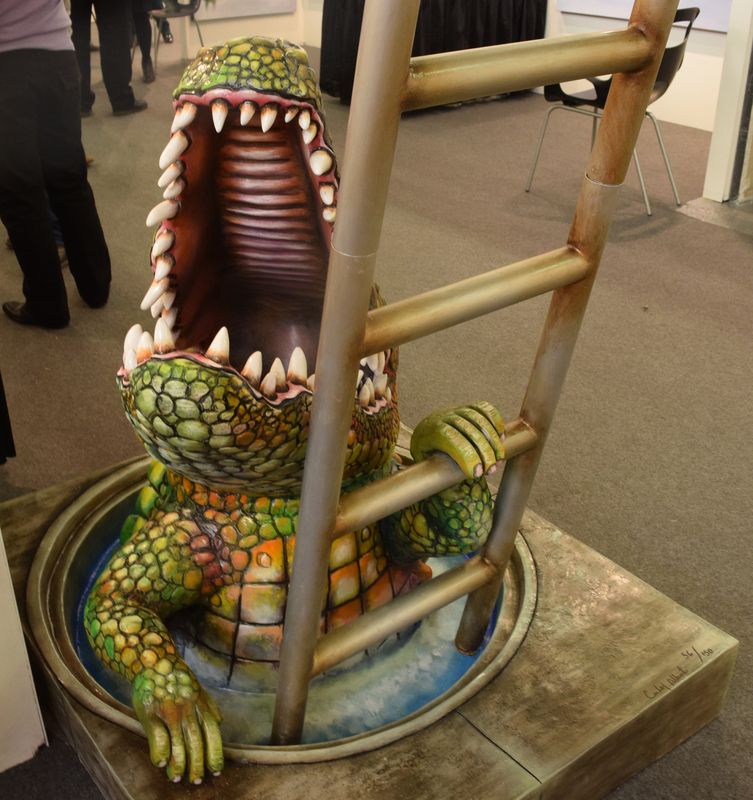 Sewer Crocodile by Mexican artists Carlos and Albert truly lives within the realm of ‘kitsch.’ After all, there are legends about crocodiles having been flushed down toilets, inhabiting Manhattan sewers and subways. So whether your tastes lie at major museums, tucked away galleries or anonymous trade shows, springtime in New York offers something for everyone including some downtime for eating and theater going. Dave and I confess to loving Junior’s restaurant. The food is always hot, reasonably priced. Their coffee and Danish at Grand Central is enough breakfast before boarding a subway to an art venue. Tourists, business men and yes, even the homeless sit side by side in the basement of this iconic structure. Over in Times Square, Junior’s larger restaurant played fifties/sixties rock as we sipped onion soup which comes smothered in melted cheese. Dave and I shared a plate of Hungarian goulash; alas, we had no room for their iconic cheesecake. However, our daughter Maddy who lives in Astoria thinks we need to be more foodie-adventurous. She took us to Tavern on Jane in Greenwich Village, a corner bar with brick interiors. Their broiled chicken, creamed spinach and potatoes au gratin were perfect—comfort food but in a more intimate space than Junior’s. Maddy was performing in Kapow-i GoGo at the PIT, a comedy club on East 24th (marathon performance May 24). Kapow-i was five hours (I am not kidding) of prat falls and spewing faux blood. It’s a spoof on video games where killing your opponents can be repeated by resetting the game, or in this case the actors. Off-off Broadway is reasonably priced compared to Broadway and often the actors are more dedicated. Dave and I hadn’t attended a real Broadway show in decades but Dave’s heart throb, Helen Mirren, was appearing in The Audience—we went. Ms. Mirren recreates her academy award winning role as Queen Elizabeth II; this time she is having private meetings with eight of her Prime Ministers as opposed to fretting over Diana’s auto accident. Ms. Mirren could read a phone book that had been rescued from a puddle. Her costume changes signaled the many decades she listened to PMs whining about Britain’s finances and political evolutions. Yes, two Corgis run across the stage looking for treats. The Schoenfeld Theater has been restored to its 19th century Baroque-esque appearance; but sit on an aisle if you need extra leg room—theater goers were smaller back then. New York in spring is full of art even if the weather is a bit iffy—go art sleuthing. Jean Bundy is a writer/painter living in Anchorage. She holds degrees from The University of Alaska, The University of Chicago and The School of the Art Institute of Chicago and is a member of AICA/USA. Jean is a PhD candidate with IDSVA. Her whaling abstracts and portraits have been shown from Barrow to New York City.